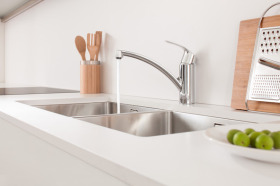 GROHE has won a kitchen tap contract with Kingfisher. The leading European home improvement retailer will feature six of GROHE’s innovative kitchen products in over 800 UK stores and across seven European countries. “The contract provides further exciting opportunities for GROHE, opening up a new major platform to showcase our kitchen products to customers,” commented GROHE head of DIY Sophie Bishop. “It is a reflection on GROHE’s high quality, easy to use and affordable products”.